Dr. Maggie O’Haire, Purdue Veterinary Medicine assistant professor of human-animal interaction in the Department of Comparative Pathobiology, is the inaugural recipient of her alma mater’s Young Alumnae/i Achievement Award. The award was presented during the 2017 Convocation at Vassar College in Poughkeepsie, N.Y., September 6. 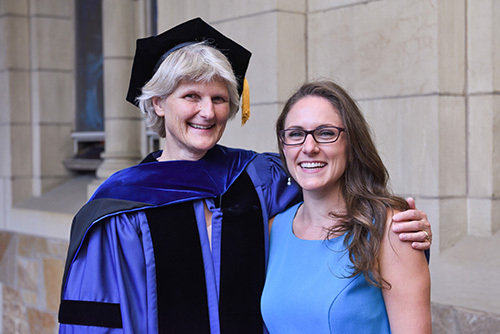 Dr. O’Haire was recognized as a Vassar alumna who graduated within the last ten years, and whose personal and professional achievements already have had a significant impact in her chosen field. 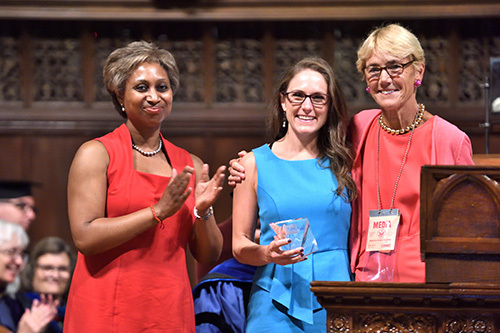 The Young Alumnae/i Achievement Award was established by the board of the Alumnae and Alumni of Vassar College (AAVC) with the goal of honoring recent graduates who are inspirational to their peers and the current student body, and who exemplify the fruits of a successful liberal arts education at Vassar. In presenting the award, AAVC President Missie Rennie Taylor described how Dr. O’Haire had a deep personal interest in the positive effects of the human-animal bond, and started conducting research on the topic as a Vassar psychology student, through independent psychology projects and papers. During her senior year, she completed an internship at a school in a nearby community that used animal assisted therapy for emotionally, behaviorally and socially challenged children. After graduation in 2008, Dr. O’Haire received a Fulbright scholarship and went on to earn her doctorate in psychology at the University of Queensland in 2014. She then returned to the U.S., and joined the Purdue Veterinary Medicine faculty. As part of the Center for the Human Animal Bond, she leads the Organization for Human-Animal Interaction Research (OHAIRE) lab, and is conducting groundbreaking research studies on the ways in which animals can help children with autism and veterans with post-traumatic stress disorder. “It was an honor to recognize Maggie's achievements in this way. Vassar is so proud, and Purdue so very fortunate,” said Lisa Tessler, Associate Vice President for Alumnae/i Engagement and Executive Director of the AAVC. Dr. Maggie O’Haire with Vasser College President Elizabeth Bradley. Dr. O’Haire was chosen for the award by a selection committee that conducted a thorough review of all Vassar graduates from the past 10 years. “It was a huge honor to be selected for this award,” Dr. O’Haire said. “I know all of my colleagues and fellow alumni have done incredible things, so for me personally, this is one of the most special awards I could receive. I am truly honored.” Dr. O’Haire said one of the most memorable moments of the convocation occurred after the presentation when one of her Vassar professors came up to her and pulled a folded document out of his shirt pocket. “It was my college paper in his class, and the topic I had selected was human-animal interaction.” Dr. O’Haire is a second generation Vassar alumna, and attended the convocation with her mother, Lise O’Haire, who graduated in 1979. Click here to view a video of the award presentation (the recognition of Dr. O’Haire begins about one-and-a-half minutes into the recording). Click here to read more about the awards convocation.